Since shifting here to Gods Hill Road back in 2003 our philosophy of being a producer of solely single vineyard wines from our beloved St Jakobi Vineyard changed. We of course still produce our single vineyard favourites from the St Jakobi Vineyard, but also wines from the three vineyards we drive past while travelling to the Semmler’s vineyard. Our philosophy these days is to only produce wine from grapes grown within close proximity of our front gate. We’ve been blessed by being able to call our little “patch of dirt” here on Gods Hill Road our home. Gods Hill Road is almost 2km long, and runs along a small hill range on the western side of the Lyndoch Valley. Along this short stretch of dirt road are some wonderful Shiraz vineyards growing on a great collection of soil types. Out of our living room window we have Max’s Vineyard established on some sandy terrain with scatterings of ironstone and quartz; Staker’s Vineyard of Shiraz is located on the eastern side of the road on Benno Semmler’s old property with red-brown earth over clay; and at the southern end of Gods Hill Road, the old (Wally) Krieg Vineyard, much of it planted back in the 1920 and 1930’s growing on some red dirt over clay and biscay soils. This, our 2016 GHR Neighbours Shiraz, is the 12th release of this wine. A blend of Shiraz from all three vineyards, the ripe red berry and plum like fruits that we know Shiraz delivers is combined with flavours of mocha and spice from the 20 months of barrel maturation. The French and American oak characters complement the sweet fruit mid palate concentration and the range of red berry flavours. Soft dry tannins highlight the finish. Glorious mouthful of flavour. Oak and fruit in complete harmony. Coffee-cream, blackberry, asphalt and tar, sweet, dry spices. It explodes from the outset and then croons its way to all corners of the mouth. Given its concentration and overall balance it will surely develop or at least hold for many years but fruit this luscious can be enjoyed fully even in its youth. 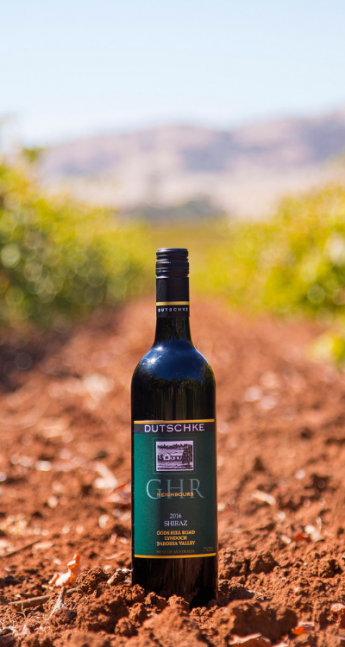 This is an action-packed release for GHR, brimming with Barossa black fruits of the kind normally reserved for much more expensive labels, backed with dark chocolate oak and firm, fine tannins. For all of its impact, it upholds classic Dutschke brightness and succulence.